Once people find out you’re from Kansas, they always want to know if you’ve ever seen a tornado. Thankfully, I never have. 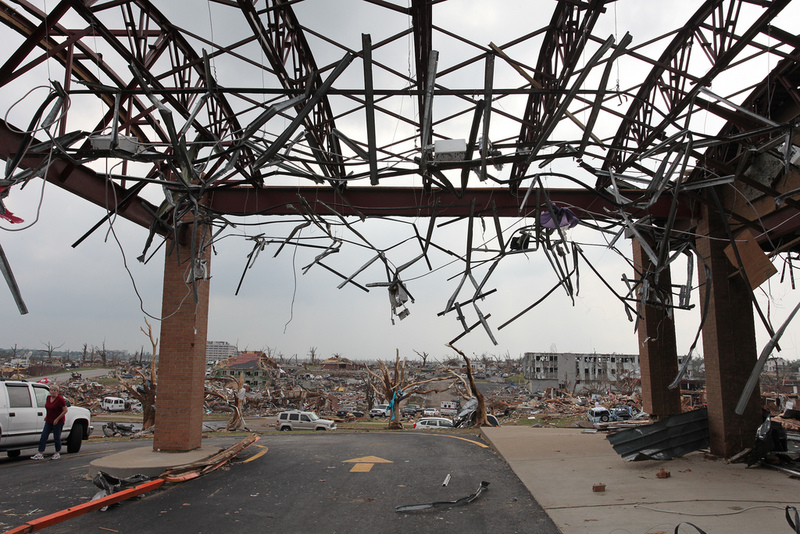 But after the May 22 tornado that tore through Joplin, I’ve definitely seen the damage it can do. After photographing the damage in the days following the tornado, Jennifer put together this slide show depicting the damage the storm did to her hometown. I typed up a few of my own first and second-hand impressions of the aftermath below. In the six weeks since the tornado, the debris is getting cleared and the city is doing some rezoning before the rebuilding begins in earnest. There are already leaves growing on the twisted remains of the trees, which looks unusual but is nonetheless a small reminder that life goes on. 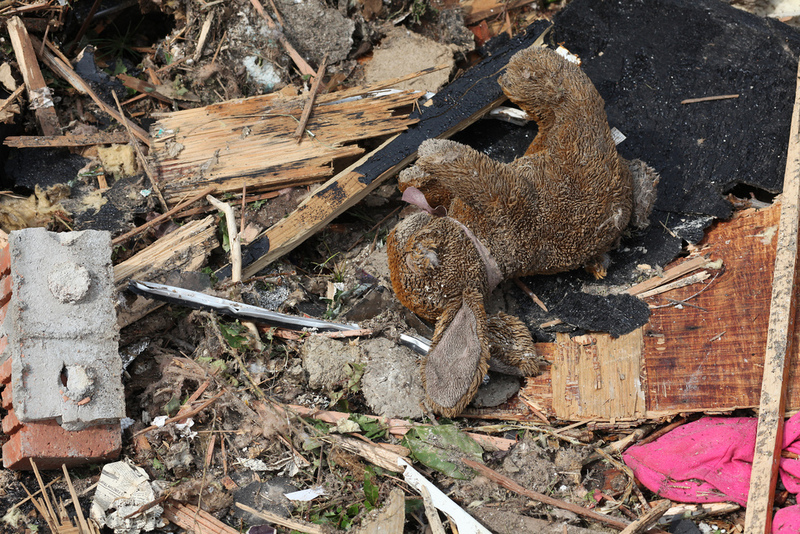 Thank you to everyone who has dedicated their time, labor and resources to helping the people in Joplin. I know they greatly appreciate it. On 1-44, the giant brown sign to George Washington Carver is turned upside-down. Coming up the crest of the hill you see a giant American flag lowered to half-mast, a torn strand of its fabric blowing as if in slow motion. Aaron and Pam were at a movie when the announcement sounded to leave the theater and take shelter. They were driving by the high school when the telephone polls and trees around them started falling, which I imagine looking like the approach of The Nothing from the “Neverending Story” or the Smoke Monster from “Lost.” As the storm began to devour the landscape in front of them, Doll threw the car into reverse, weaving around debris and crashed cars until they got out and ran for shelter. It doesn’t matter how much you’ve seen on TV or in photos — nothing can prepare you for your first visit to the disaster area. After only a couple of blocks you feel like you’ve entered an impossibly vast and detailed disaster film set. The trees that are left are macabre sculptures, mattress linings and car parts impaled on their bark-stripped upper branches. Where you used to be able to see only a few blocks you can now see several miles. Dan and I drove through in his truck at dusk, just before curfew. Most everyone had gone home, wherever that might be now, but one man stood in the middle of his lot staring off to the south. Dan offered me a beer from the back seat and said why don’t you grab one for me, too. I don’t think anyone is going to mind. At night a wall of police cars and armored vehicles blocks off entry to the disaster area. We began to refer to the once perfectly normal patch of neighborhoods as the “demilitarized zone,” or — in the fashion of Tarkovsky’s “Stalker,” just “The Zone.” To get downtown from the south, you have to drive all the way around the zone on either side. Not that you would want to go through the disaster area at night anyway. Too dark, too spooky, too tragic, too soon. Aaron and Casey nailed a 40-foot American flag to the front of what remained of the house — a crafty way to discourage looting and be patriotic at the same time. A man walking by with his wife stopped and pulled out his phone. “What are you doing?” the woman asked her husband. “Just taking a picture of some real Americans,” he said. The week before the storm I called Cool Guitars on 26th to see if they still had that Regal guitar in stock, a resonator guitar that used to belong to the owner. They said they had several Regals in stock, so I set aside a good chunk of my first paycheck toward purchasing one. After the storm we drove by and saw their sign but no trace of the store itself. I have no idea what happened to all those guitars. Driving down Main Street wondering where Main Street went. In a video I’ve seen reposted several times, a group of amateur storm chasers drive parallel to the storm’s path from miles away, marveling at the “monster tornado” moving over the city. I’ve got it all on film, one guy keeps repeating; the camera’s impartial recording a proxy for what he can’t believe he’s seeing with his own eyes. The fascination takes a dark turn when they drive back into town on South Main only to find everything around it destroyed. “This is ridiculous,” one of them says, sounding scared. One thing to watch a funnel dancing from a distance, another to look a tornado in the face. Joplin High School is destroyed, but the sign on the corner of the lot has been turned into an inspirational shrine. An “H” and an “E” have been added to either side of the only remaining letters in the city’s name, the “OP.” The “HOPE high school” sign is presided over by life-sized wooden sculptures of eagles — a tribute to the school’s community and mascot. Jenn’s family salvaged everything they could from her Grandma’s house by the end of the first week, but the grandkids decided to go out Saturday morning to try and find her wooden statue of the laughing Buddha. Don’t worry, Dan said, it’s one of the first things I grabbed. But even with Buddha saved and cleaned, we still craved a totem of recovery, of salvage-tion. After seeing the decapitated Papasan statue on a shelf, we dug through the debris to try and find his head. Miraculously, Jessica found it after only a few minutes. It’s in good shape except for the missing beard. But that can be glued back on again. Jenn and Luke- Just finished watching the video you put together. The pain and long term suffering Joplin is undergoing is well represented in your pictures -their courage and faith in the future represented in your script . God be with your family and all the people of the city. lucas wetzel Create a free website or blog at WordPress.com.